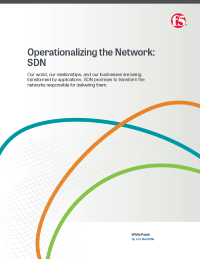 Download this whitepaper and learn how SDN can be used to transform your organization’s network to support applications and meet the expectations of the customers, partners and expectations of the customers, partners and users that rely on it and achieve greater economies of scale. We live in an increasingly application-driven world, and while networks have been successfully designed to meet the predictable needs of a web-based economy, they struggle to meet the needs of today’s on-demand, application-oriented consumers. Software-defined networking (SDN) promises to ease the transformation required in networks to become more agile and adaptable, but classic SDN has been inefficient. An emerging definition of SDN that focuses on the operationalization of the entire network on the other hand does just that.